There was even more reason to Party In The Paddock in Tassie this weekend, with the beloved festie bearing witness to its first ever engagement! Two longtime Paddock patrons (and diehard Yungblud fans) – Hayley and Grace – had been going steady for 5 years, and to mark their fifth PITP experience together, Hayley organised to pop the question live on stage during their fave Brit punk’s set! Naturally, to the tune of his breakout hit ‘I Love You, Will You Marry Me?’ of course. 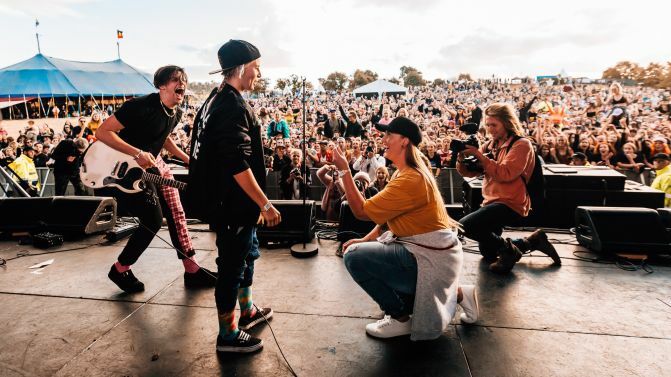 Apparently, with the help of Yungblud himself and festival organisers, Hayley duped Grace into believing she’d scored a backstage pass to watch the set from side of stage, before the heart-swelling surprise marriage proposal went down in front of thousands of fellow fans. Watch the beautiful moment below, and you can catch Yungblud performing live in Adelaide, Sydney and Perth this week!